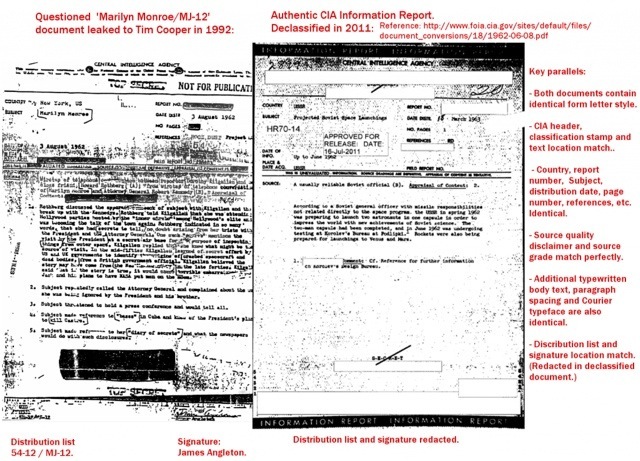 New evidence has just been released supporting the authenticity of a leaked CIA document allegedly of wiretaps of Marilyn Monroe and her friends shortly before her suspicious death on August 4, 1962. The wiretap document revealed that Monroe was planning to give a press conference about what President Kennedy had told her of a visit to an undisclosed Air Force facility where he saw the debris of a crashed UFO. The Monroe wiretap document was first leaked in 1992 to a UFO researcher, and was made public in 1994. It has not been confirmed by the CIA to be genuine, and remains open to dispute. The new evidence that was revealed yesterday shows that the leaked document conforms closely to a standard classified Information Report form used by the CIA in 1963. Either someone broke the law by forging or using a standard CIA Information Report form for classified reports at the time of Monroe’s death, or the Monroe wiretap document was indeed a classified report about a wiretap of Monroe and her friends. During the process of researching this article I spent several hours at the CIA’s electronic reading room looking at documents from the 1960s, in an attempt to find examples of similar typeface to that seen in our questioned document …. I discovered a CIA Information Report dated 18th March, 1963 with the subject heading: “Projected Soviet Space Launchings” which was declassified on the 16th of July 2011. This authentic CIA information report is an almost perfect match in style and presentation for the leaked ‘Marilyn document’.